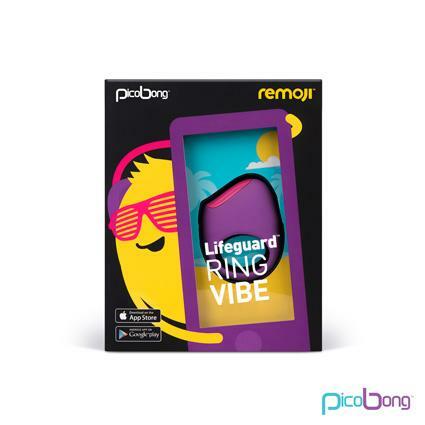 Remoji Lifeguard Ring Vibe Purple. Lifeguard is a stretchy silicone couples' ring accommodating all sizes, offering mind blowing pleasure and intense external vibrations that are felt by both partners. The 6 different vibration modes have variable power you can control remotely - just download the REMOJI app, turn on your Bluetooth and let Lifeguard make sure you are never out of your depth. PicoBong toys are made with the highest levels of quality and safety in mind, which is why we only use body safe silicone and ABS plastic. Near silent operation. Not only is the motor strong enough to knock your socks off, but it does so in the quietest way possible. Waterproof vibrations. Being fully waterproof to 1 yard, not only are PicoBong toys easy to clean, but they are also ideal accessories for the bath, shower, swimming pool, even a babbling brook, if that is your thing. PicoBong toys offer versatility that is perfect for use whenever, wherever and with whomever's got your fancies tickled. 6 modes. An amazing 6 different vibration patterns can be enjoyed over multiple speeds, providing a spice based cliche concerning variety and life! 1 year warranty. Every so often, a lunar eclipse occurs. Just as often, a PicoBong toys can sometimes go wrong. In case something has slipped by, PicoBong toys a comprehensive 1 year warranty on all toys. USB Rechargeable. How much fun is enough? More, always more. So once your battery goes, simply recharge it. And keep on having fun. Download vibrant, interactive REMOJI app and connect with your partner in a whole new way. Use Bluetooth to connect and pair with device and you will be able to tap, poke and swipe to create mind blowing orgasms! High end design. Beautifully designed, completely made of super smooth body safe silicone and ABS plastic and 100% waterproof. Ultra vibrations. With more power than ever find the right vibe for you and, when necessary, just USB recharge.